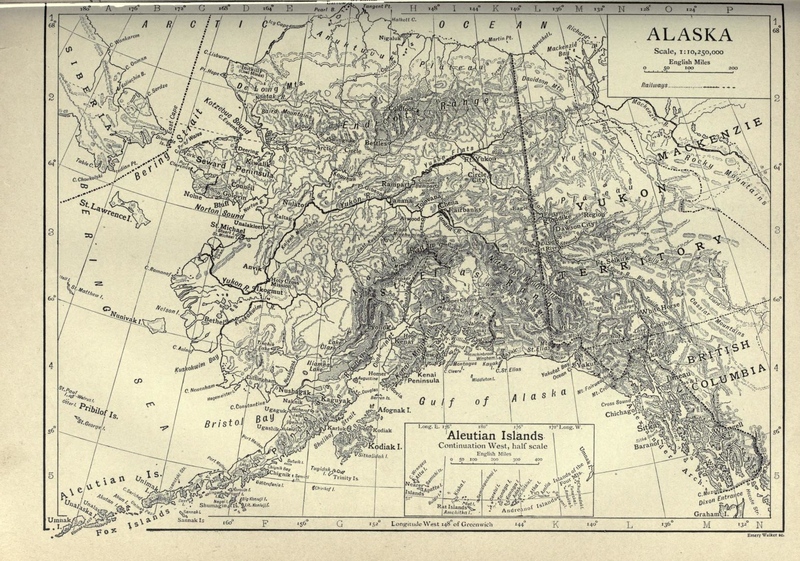 Vintage Alaska map from 1911. The full state is displayed including the Aleutian Islands. Back then, Alaska was only a district of the United States of America. It wouldn’t be until 1959 that it would become a state. The 1911 encyclopedia said that there was limited information about the district until gold was discovered in the Klondike in 1896. The US Geological Survey and the Department of War had been documenting the physiography of the area only since 1895. Before the August 1900 opening of the railway between Skagway and White Horse, Canada getting to the interior sections of Alaska could only be done on foot with pack animals. When the United States took possession of the district in 1867, it was thought there were only 30,000 people living in Alaska; 66% of which were Eskimo and other indigenous peoples. By 1900, the population had grown to 63,592 with only 46% being natives. Sitka was the capital of the territory until 1906, when it was moved to Juneau. It doesn’t look like there is anything identifying either city as the capital on this vintage Alaska map. The map image shown is a slightly smaller size than the original. To view the full-sized Alaska map, simply click on the map.